Since I posted a picture the other day of our morning breakfast smoothie on our Facebook Page, I have had so many requests for the recipe from around the world. The recipe is so easy I never thought to write it down. Tonight I measured the ingredients, well some of them so I could share the recipe. In a blender add 2 cups of juice; this can be any juice you like. I usually use cranberry and sometimes I will mix apple and cranberry. Add 1 cup of vanilla yogurt, 1 cup frozen berries and 1 frozen banana. I like to use the mixed berry package and I really like a bit of peaches in mine too so I’ll add frozen peaches if I have them. Pulse the blender until the frozen ingredients are blended well with no big chunks, this may need a few pulses and you might need to stir it with a spoon to make sure everything gets blended in the bottom. Be careful not to blend to long because you really want the mixture to be partially frozen and hold up in the glass. This will make about 4 smoothies. If your smoothies are to juicy add a bit more frozen fruit or more yogurt. 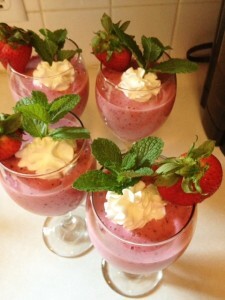 Garnish the glass with a dollop of whipped cream, a sprig of mint and maybe a piece of fresh fruit. I have also made the smoothies without yogurt and instead used Almond milk, this did take more berries to get the right thickness but the guests who requested it found them to be delicious. This entry was posted in Breakfast Recipe by Tammy D. Bookmark the permalink.